I like scallops. During our vacation in Toronto, we came across these frozen scallops at the supermarket. Compared to what we get in Hong Kong, they were gigantic. Normally, the only ones available in this size are the Japanese scallops and they are usually used for sashimi. What amazed me was that these Japanese scallops are only good as sashimi. 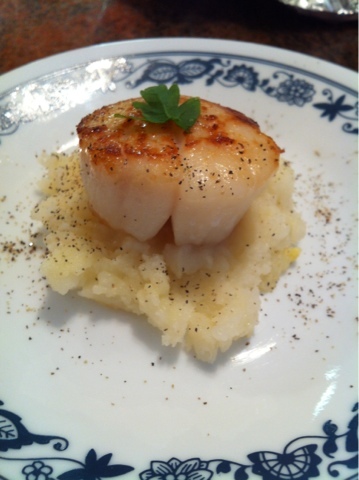 These US scallops were extremely tasty and sautéed to perfection - just a minute on each side. And because we were on holiday, we could only spare time for these as breakfast items !